On March 4, Kenya held a general election in which the president, senators, county governors and members of parliament were chosen. Regina Mburu, CFCA communications liaison for Africa, is from Kenya and voted in the election. Regina shares her story of voting, of patiently waiting for the results and hoping peace would prevail. As dawn broke and the sun made its way up to brighten the rather dull skies, my country, Kenya, was ready to usher in a new era ó one that the people hoped would bring along good tidings. As early as 4 a.m. on March 4, Kenyans were already lined up in different polling stations all over the country, eagerly waiting to cast their votes. The atmosphere was full of excitement, but at the same time there was tension hidden behind the smiles. The events of the 2007 election, in which more than 1,000 people were killed, were still fresh on the minds of many. Over the past few months, many peace campaigns were held, and Kenyans consistently prayed that peace would reign during this election period. I made my way to the polling station about 5 a.m., to cast my vote for the politicians I deemed fit to take up the various leadership roles. After a few minutes of scrambling through the gates of the polling station, I found my way in and cast my vote. As evidence that I had voted, my pinky finger was dipped in ink. 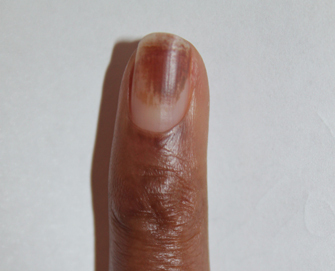 Regina’s pinky finger was dipped in ink to show she voted in the 2013 Kenyan elections. Walking through the streets back home, I was grinning from ear to ear. I was so excited to have been part of this significant election process in my country. The hot rays of the sun did not deter the thousands of people in the long lines, and each person waited for their turn at the ballot box. The voting process went on late into the night. On March 5, the tallying process officially started. Kenyans waited patiently for the outcome of the election. Many were hoping that the country would remain calm during this process. The streets remained clear, and everything was at a halt as many people decided to stay indoors, following the results through television and radio broadcasts. The air was heavy with anticipation and there was an uneasy calm in the air. Some speculated that the tallying process was being doctored, and votes in some counties were recounted. This further delayed the long-awaited results. Government and church leaders, however, urged people to be patient. I remember being awakened by a commotion outside my neighborhood, and I was so scared thinking that the violence of 2007 had come to life again. I listened keenly, and heard noises of jubilation! Cars honking, people whistling and blowing a type of horn called a vuvuzela. In the wee hours of Friday night, the votes had finally come in. We now had a new president-elect! The official announcement was made on March 9, and Kenyans were in a celebratory mood. Not only had we elected a new president and other government officials, but we had done it peacefully! Our president-elect is Uhuru Kenyatta. The swearing-in date has been postponed, however, because one of the contestants in the presidential race, Prime Minister Raila Odinga, has filed a petition to challenge the election results. We are waiting for the courtís decision as a country to know what is next. We pray that peace will prevail at this time as it did during the voting. I am so proud of my country and the level of maturity everyone showed during the voting process. This time, no one had to bleed for someone to lead. Granddaughter, I am so happy to hear the good news. I will pray for a peaceful transition. You have a beautiful country filled with wonderful people. God bless you and God bless Kenya. Beautiful. I have three sponsored friends in Kenya and hope to visit in the next 3 years. MaryAnne Cullen, thank you for your gift of sponsorship. You are most welcome to visit Kenya. We will be waiting for you!